Advisor can help you take an objective approach in order to identify your good and bad financial habits. This is the first step toward developing a BUDGET. 1. Identify your goals, by sorting out what are your NEEDS (must haves) and what are your WANTS (nice to have). Examples of NEEDS would be paying off the mortgage sooner and getting out of debt faster, establishing an emergency fund, saving for your child’s education, and saving for your retirement. WANTS would be buying a bigger house or a more expensive car than you really need. 2. Create a written plan that includes timelines and lists of steps you need to follow in order to achieve those goals. 3. Reallocate your monthly spending to accommodate those needs. 4. Once you know your BUDGET has addressed your NEEDS, you can examine what WANTS you could budget for, such as saving for a vacation or following an interest or hobby. If you would like to assess how you can better handle your CASH FLOW, contact me today. 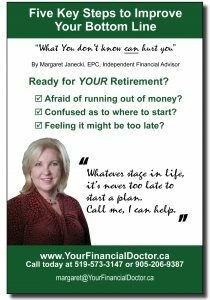 I can help you review and identify your financial picture and develop a plan. ← Are your loved ones protected, should you pass away unexpectedly?